During a period spanning 2005 through 2009, Apple and several other high-profile tech companies effectively signed off on anti-poaching agreements, whereby they agreed not to recruit employees from one another. The participants included Apple, Google, Adobe, Intuit, Lucasfilm, Pixar, and Intel. News of these agreements first made headlines back in 2010 when the aforementioned companies settled a lawsuit on the matter brought on by the US Justice Department. In 2011, the story made headlines once more when a group of software engineers filed a class action lawsuit against those same companies alleging that the anti-poaching agreements operated to limit their negotiation power, ultimately resulting in lower salaries. In the most recent peek into the backhanded deals that once limited employee mobility in Silicon Valley, PandoDaily this weekend published a boatload of new information about the case along with a number of emails demonstrating that Steve Jobs was none too thrilled with Google's efforts to recruit Apple engineers. 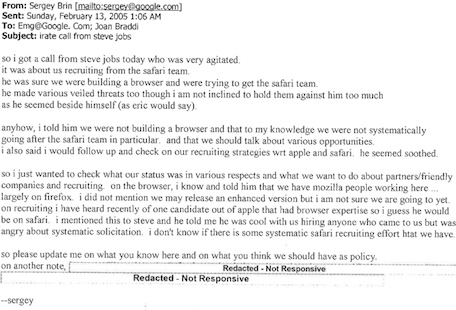 On February 13, 2005, Google co-founder Sergey Brin fired off the following email regarding an "irate" phone call he received from Steve Jobs regarding Google aggressively recruiting Apple's Safari team. In truth, court documents show that Google was primarily interested in a star engineer on Apple's Safari team. A few days later, Brin sent the following email to a few Google employees, including former Google and current Apple board member Bill Campbell. The email relays another "irate" phone call Jobs made to Brin. I don't think we should let that determine our hiring strategy but thought I would let you know. Basically, he said "if you hire a single one of these people that means war." I said I could not promise any outcome but I would discuss it with the executive team again. I asked if he expected us to withdraw offers and he said yes. In reviewing the data below again, I do think this could be treated as not just an employee referral since he referred essentially a whole team. So a compromise would be to continue with the offer we have made to REDACTED but not to make offers to any of the others unless they get permission from Apple. In any case, let's not make any new offers or contact new people at Apple until we have had a chance to discuss. Notably, court documents reveal that Apple and Google's anti-poaching agreement with one another went into effect on March 6, 2005, not too long after these emails were exchanged. Note that in late February of 2005, Apple VP of Human Resources Danielle Lambert sent the following email to Apple's recruiting group. Please add Google to your "hands-off" list. We recently agreed not to recruit from one another so if you hear of any recruiting they are doing against us, please be sure to let me know. The deals agreed to by the companies involved worked as follows: Hiring employees who independently expressed interest in a position was okay. Cold calling employees at other companies, however, was not allowed. Particularly interesting is that the anti-poaching agreements in question encompass many more companies than previously publicized. For instance, some of the other companies that appeared on Google's "Do Not Cold Call" list included Paypal, Comcast, and Genentech. 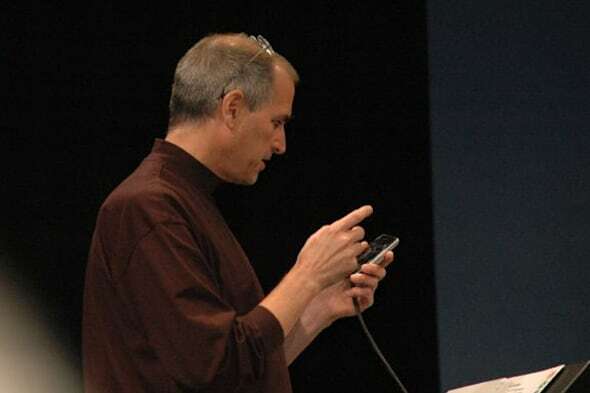 With respect to Apple, their "Do Not Cold Call" list, as of July 2009, mentioned upwards of 27 companies, including Microsoft, AMD, Foxconn, Nvidia, Best Buy, Mac Zone, and more. This trial is certainly bound to get more interesting as it adds even more details to what is already a rather intriguing case. You might recall that previous documents brought to light relay that Jobs in 2007 threatened then Palm CEO Ed Colligan with legal action if Palm didn't agree to stop recruiting Apple employees. Further, Jobs in 2007 emailed Eric Schmidt -- who at that time was Google's CEO -- asking that Google's recruiting department stop recruiting an Apple engineer. Schmidt's response promised that he would "get this stopped." Lastly, make sure to head on over to PandoDaily for the full run down of just how deep and broad these anti-poaching agreements ran.